September 17, 2018, by Markeshia Ricks-"The Whalley Avenue gateway to the heart of Westville just got a bit more eye-catching. 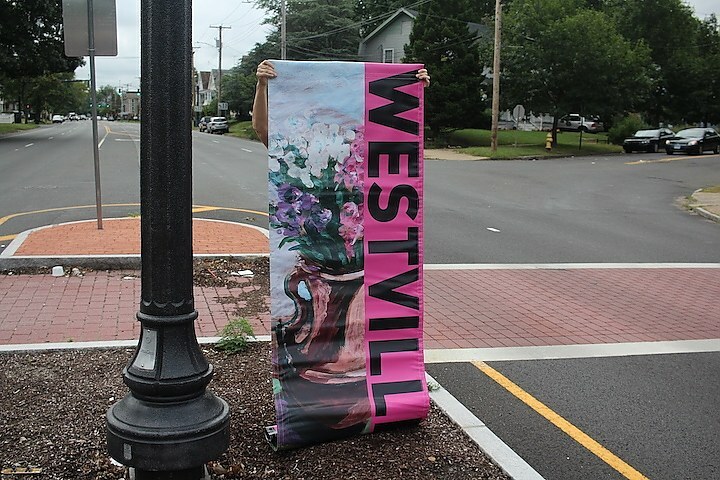 Banners provided by the Westville Community Management Team and Southern Connecticut State University have been added to the almost two-year-old, decorative median that divides and calms traffic on Whalley Avenue leading into the Village. The banners went up Friday morning. Lizzy Donius, who heads up the Westville Village Renaissance Alliance (WVRA), and artist Susan McCaslin, made sure that they had all the banners sorted properly. Donius was almost giddy that the banners finally were going up. They’d been in her office for the last couple of months. Getting them up had been delayed by scheduling and weather. The management team had approved using a little over half of the $10,000 that the neighborhoods get each year to put up a large banner that would hang across Whalley Avenue and promote village happenings. But the exorbitant costs of the polls and finding a suitable location thwarted that idea..." Click HERE to comment and read full article.